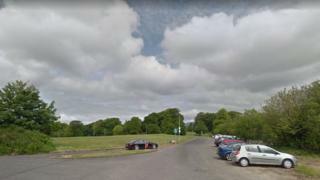 Some Londonderry residents are "living in fear" after recent attacks in St Columb's Park, its manager has said. A number of people have been targeted in the park in recent weeks, leading to an increase in police patrols. Helen Henderson said some of the incidents were sectarian in nature. DUP politicians met police officials on Monday to discuss solutions to the ongoing anti-social behaviour, which has been exacerbated by alcohol consumption in the park. "There are definite issues in the park around drinking and obviously we know that with alcohol things escalate," Ms Henderson told BBC Radio Foyle. "There was an attack a couple of weeks ago which started out with some sectarian slurs. "Whilst park rangers can report seeing kids playing happily during the day, as the evenings go on and alcohol is consumed, that's when this gets out of hand." "Talking to the local residents you definitely get a sense of fear, especially with the elderly population. "It's important to address those fears but I think the best way to ensure the park doesn't become a no-go zone is to ensure people are using it." One man, Allister Gault, told the BBC his son was knocked unconscious last week. The 21-year-old had been at the birthday party of a Catholic workmate in the city centre. He was making his way home when he was mugged and was called sectarian names by a group of youths. Mr Gault said his son was left shaken by the ordeal and may have sustained a cracked rib. DUP MLA Gary Middleton said a number of organisations, not just the police, needed to work towards a long-term solution, adding that he'd held talks with community leaders and residents on Thursday. "They did say to us that they were concerned that this issue was not being dealt with," said Mr Middleton. "We need to get to the stage where there is no need for a huge police presence at St Columb's Park... to protect those residents." Mr Middleton added that the "overwhelming majority" of park users behaved responsibly. However, Ms Henderson said there had been a rise in disturbances at the park since the Peace Bridge was built in 2011. "Last summer we definitely saw an increase in under-age drinking behaviour, and this year as well," she said. "There is a small group that do spoil it for other people and it's about putting out a message that this behaviour will not be tolerated."